Sterilite is for Your Pets Too! National Adopt a Shelter Pet Day is coming up on April 30. Whether you are preparing to welcome a new furry friend to your family or already have a cat or dog, Sterilite's line of pet care products is here to help. These pet care products are stylish and functional and include both food dishes and pet litter products. 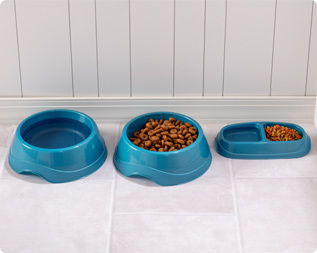 Sterilite offers three pet food dish options to ensure you can create a solution that fits you and your pet's needs. The Sterilite double dish is available in small and large, providing a combined food and water solution for pets of all sizes. The Small Double Pet Dish has a capacity of 16 ounces, while the Large Double Pet Dish has a capacity of 50 ounces. The Large Round Pet Dish offers a single compartment with an ample capacity of 64 ounces making it the perfect choice for large dogs. All three dishes feature a durable no-tip design to stop your furry friends from making a mess. They also feature recesses in the base to make picking up and moving the dishes easy and comfortable. The smooth, polished finish of the dishes makes them easy to clean. They are also dishwasher safe as well as free of BPA and phthalates. For cat lovers, Sterilite has your kitty litter needs covered with two great litter pan options as well as a cat litter scoop. Both cat litter pans contain reinforced rims for added strength and comfort while lifting, carrying and emptying. 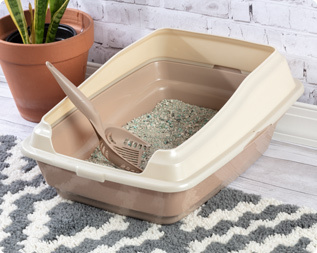 The Large Cat Litter Pan's low front makes an easy entrance for your cats, and for cats who dig, the tall back keeps the litter in the pan and off your floor. For especially messy cats, Sterilite also offers a Framed Litter Pan that includes a snap-on frame that adds height around the back and edges to contain litter scatter. To make regular cleaning easy, the Cat Litter Scoop has a comfort grip handle and sturdy design. The slits in the scoop sift out clumping litter, leaving dry litter in place and the polished finish is easy to clean. Sterilite's line of pet products are here to simplify caring for your pet. Let our hassle-free bowls and helpful litter options make your life a little easier. Sterilite has pet food and water solutions for all sizes of furry friends. Sterilite's Framed Litter Pan offers your cat an open litter pan while containing litter scatter.